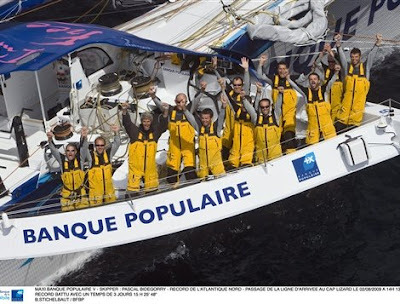 3Days 15h 25min 48s - Banque Populaire V beats Groupama 3 to the finish and breaks record! Groupama 3 crossed the finish line on her Transatlantic record attempt this Sunday 2nd August at 1425 UT. The trimaran driven by Franck Cammas and his nine crew took 3 days 18 hours 12 minutes 56 seconds to cover the 2,880 miles which separate the Ambrose Light (New York) from Lizard Point (Cornwall, UK) at the average speed of 31.92 knots (57 km/hr).